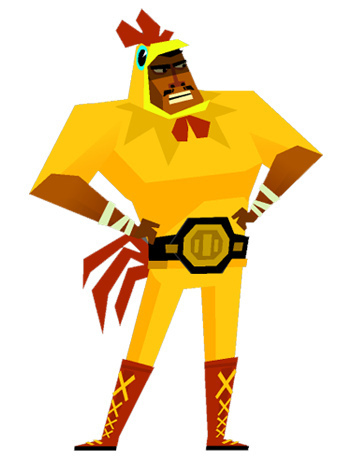 Posted on June 4, 2013	by Derek "Gamer Crash"
Looking for more things to suplex in the excellent downloadable title, Guacamelee? Lucky for you, DrinkBox has just what you’re looking for with the Costume Pack. Don’t be fooled by the term “costume pack” however as this is no mere horse armor content. There’s more here than meets the eye. The content comes with 3 costumes for Juan and Tostada to wear, each with a different gameplay changer attached to it. So think of these costumes as a sort of risk/reward element to the game. Pollo Luchador: Juan and Tostada dress up in a giant chicken costume. Not only will you be able to communicate with the many various chickens around the world, but you’ll also regenerate health over time. The risk element to this costume is that stamina regenerates much slower. Skeleton: With this costume, you’ll have infinite stamina. Sounds great right? The bad news here is that health orbs no longer drop. Essentially, the only way to recover lost life is to hit a checkpoint. Identity Swapped: With this outfit, Juan and Tostada switch costumes making their attacks much stronger. The downside is that their throw damage is reduced. The DLC will be accompanied by a patch that will allow Vita and PS3 players to play as Tostada. Currently, she isn’t available in the Vita version, and on the PS3 she’s regulated to the 2nd controller. This patch will finally correct that. Okay, sure, it’s not a new area to explore, but with new trophies to unlock and gameplay to master, there’s certainly more than enough reasons to jump back into the ring. The content should be available later today when the PSN store updates for the small price of $1.99. This entry was posted in News and tagged news, PS3, Vita. Bookmark the permalink.